Bariatric surgery has been shown to improve postoperative weight, sleep apnea, and pulmonary physiology. However, It and should be considered in sleep apnea patients with a BMI greater than 35 mg/kg2. If your diet and exercise have had limited success in the treatment for obesity, bariatric surgery can be one of the harsher methods regarding the optimal weight reduction. The weight reduction surgery is a serious life changing operation, because it forces you to reduce the amount of food that you consume by making your stomach smaller through different types of surgery. There are several types of bariatric surgeries. In this video, you'll learn what are those types, and how are they performed by the surgeon. This is the most common weight loss surgery performed today, where the stomach is reduced in size by dividing the stomach in two parts. The small upper part of your stomach will receive the food from the esophagus and empties into intestines that has been brought up and attached to it. For more info about this surgery, see Gastric Bypass Surgery. Also called lap-band surgery, it's performed by placing an inflatable band around the upper part of the stomach. When the band is inflated, your stomach turns to a small sack with a small drainage opening. The inflation of the band is adjusted through a tube leaving the band from an aperture outside the abdominal wall. This surgery allows the patient to eat much less. It consists of a laparoscopic surgery in which with the help of an auto-suture machine, the stomach is sectioned leaving a thin gastric tube. This surgery as with the gastric bypass, are the only procedures where an appetite regulating hormone, the ghrelin, decreases significantly, and in result the patient has less appetite for about 4 to 6 months. 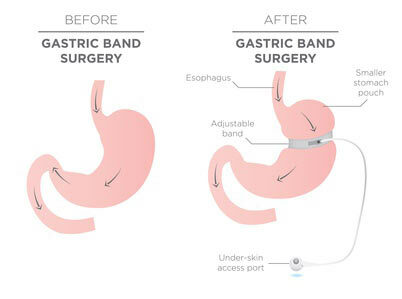 Researches suggest that lap-band surgery is not so effective as gastric bypass surgery, and can damage your esophagus or stomach, or you may have problems with the inflatable band. Who are the candidates for weight loss surgery? you have body mass index (BMI) greater than 40.
you have BMI of 35 to 39 with life-threatening conditions such as hypertension, cardiopulmonary disorders or diabetes mellitus. you have not been successful with natural weight loss program for at least five years. your age is between 18 and 60 years old. Which weight loss surgery should you choose? Bottom line... Bariatric bypass surgery has been shown to have success in sleep apnea. It may be an effective solution for severely obese apnea patients whose doctors consider them to be good candidates for this type of surgery. However, due to long time required for weight loss, you should continue you therapy with CPAP until you will see an improvement in your weight. If you can't tolerate your CPAP machine, try other methods and procedures that may be contemplated in addition to the bariatric bypass surgery. Your doctor should know what choices do you have.